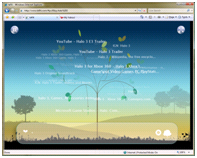 Tafiti is a search visualization application built with Silverlight 1.0 and the Windows Live APIs. The Tafiti code is hosted on CodePlex under the Microsoft Public License (MS-PL), as announced by Marc Mercuri last month. // Rewrite XAML to give the elements unique names. // This is necessary because all names have global scope in WPF/E. // names["name"] is set to "uniquename". It was indeed an adventure creating Tafiti...it does push the envelope for what's reasonable to do in SL 1.0. And bear in mind that it was started with early CTP builds of Silverlight that had even less infrastructure than 1.0 does! I am looking forward to 2.0, for sure. But, that said, it isn't really any more unreasonable than what a lot of sites do in DHTML, which doesn't have a control framework either. I agree, if 2.0 weren't on the way, no doubt we'd end up with the equivalent of Prototype or JQuery (perhaps derived from Tafiti) to take care of the heavy lifting. The control framework in Silverlight 2.0 alone will make this all less complicated. Plus, who knows which of the layout controls will be included. I just hope that Blend 2 will actually render controls, because currently the Blend 2 December Preview doesn't even render placeholders when you're looking at a XAML page with controls on it. @Walter : Yes, what people have done with DHTML is pretty amazing.